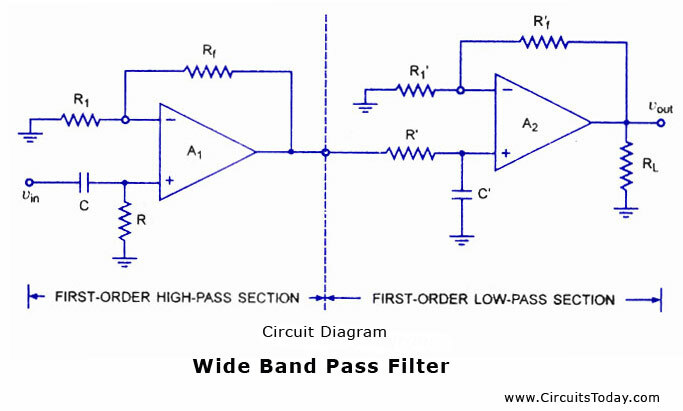 A band-pass filter is a circuit which is designed to pass signals only in a certain band of frequencies while attenuating all signals outside this band. The parameters of importance in a bandpass filter are the high and low cut-off frequencies (fH and fl), the bandwidth (BW), the centre frequency fc, centre-frequency gain, and the selectivity or Q. For a wide bandpass filter the centre frequency can be defined asÂ where fH and fL are respectively the high and low cut-off frequencies in Hz.In a narrow bandpass filter, the output voltage peaks at the centre frequency fc. A wide bandpass filter can be formed by simply cascading high-pass and low-pass sections and is generally the choice for simplicity of design and performance though such a circuit can be realized by a number of possible circuits. 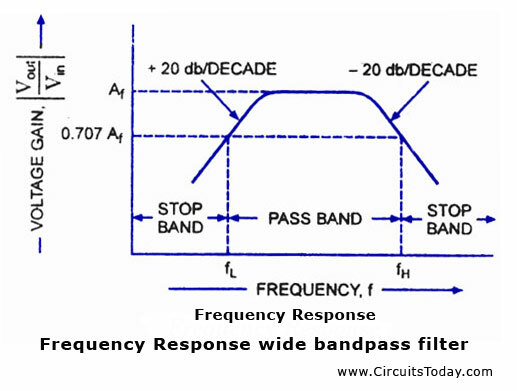 To form a Â± 20 db/ decade bandpass filter, a first-order high-pass and a first-order low-pass sections are cascaded; for a Â± 40 db/decade bandpass filter, second-order high-Â pass filter and a second-order low-pass filter are connected in series, and so on. It means that, the order of the bandpass filter is governed by the order of the high-pass and low-pass filters it consists of. A Â± 20 db/decade wide bandpass filter composed of a first-order high-pass filter and a first-order low-pass filter, is illustrated in fig. (a). Its frequency response is illustrated in fig. (b). A narrow bandpass filter employing multiple feedback is depicted in figure. This filter employs only one op-amp, as shown in the figure. In comparison to all the filters discussed so far, this filter has some unique features that are given below. 1. It has two feedback paths, and this is the reason that it is called a multiple-feedbackÂ filter. 2. The op-amp is used in the inverting mode. The frequency response of a narrow bandpass filter is shown in fig(b). Generally, the narrow bandpass filter is designed for specific values of centre frequency fc and Q or fc and BW. The circuit components are determined from the following relationÂ­ships. For simplification of design calculations each of C1 and C2 may be taken equal to C.
The gain Af however must satisfy the condition Af < 2 Q2. can you please let me know how can I calculate the bandwidth and Fr of the filter? would you please let me know after selecting the standard resistors, how I can calculate the Fc, Q , Gain erros? (I mean the errors produced by rounding values). Customer required band pass filters for space application and confirm the same in your scope of supply and on on confirmation will send you details. Looks like it’s time for some algebra.